Indonesia, my wife's former country, is a land where the charts are dominated by pop offerings. I've heard there's a death metal scene which I have yet to check out, but the overall listening habits of almost everyone I know there tend towards the frothiest of pop music. 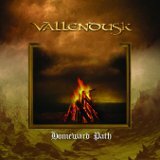 Which made it all the more of a pleasant surprise when Vallendusk's second LP, Homeward Path, came to my attention, with a sound that seems to belong more to the frozen wastelands of northern Europe than to the muggy climate of Jakarta, but with an overall signature of comfort rather than loneliness. Windswept Plain starts with some sweeping of its own in the form of a fierce but melodic storm of tremolo-picked guitar, switching at the drop of a hat to folky, Agalloch-style acoustic musings underscored by the distorted rhythm guitar. They've got a Hammond and Leslie organ that gives the songs a nice prog-rock flair, and the following track, Earth Serpent, feels like a continuation, as if they couldn't manage to pack everything they wanted into the first track. Rizky's mid-range growls are throaty, reminding me of John Haughm's style, and his rare clean vocals, in contrast to many atmospheric black metal bands, are free of any trace of whininess. The superb sense of timing of this band, though, is exemplified in Derek P.'s drumming, which is beautifully produced and is as precise as an automaton. Some songs, such as The Wayfarers, will halt abruptly for a dramatic moment and then resume blasting on the double-kick, which were passages I particularly enjoyed. The part most surprising here is how...well...soothing the album sounds. Most black metal is designed to be as bleak and menacing as possible, and all too often, when a black metal album is gentler, it degenerates into aimless, synth-dominated emo garbage. No one can accuse Homeward Path of the latter, but for all its ferocity in the picking and double-kicking department, it is filled with uplifting melodies that leaves the listener with the kind of catharsis that one gets from watching a movie where the good guys suffer, but still ride off into the sunset in the end. Their organ has a lot to do with it; its old-fashioned sound make a hypothetical synth keyboard alternative seem like it would be fake and hollow by comparison. The production is another win; everything sounds crisp and stark, with the exception of Rizky's clean vocals, which appear to have been deliberately muddied on the last track, Grains of Horizon, which ends the album with a final clean instrumental melody in the last minute of the song. I found Homeward Path to be as excellent as it was unexpected, and I definitely recommend this one for any black metal fan. It shows some influences from northern European black metal pioneers like Emperor, but the band members have clearly moved beyond merely playing in the styles of their predecessors and have a unique style of their own. That style, here, results in a dark but positive album that is almost impossible not to like.